“Concurrency with Modern C++” is a two-day training course with programming examples taught by Rainer Grimm. It is offered at the Gaylord Rockies from 9AM to 5PM on Saturday and Sunday, September 14th and 15th (immediately prior to the conference). Lunch is included. This class gives you a detailed insight into the multithreading facilities of C++11 and C++14, the parallel algorithms which we got with C++17, and the new way of concurrency, we will get with high probability in C++20. Additionally, we will have a more in-depth look into the C++ memory model consisting of the atomics and the various memory orders in C++. This insight will provide you with a better understanding of the general concurrency features of C++. In the class, I will give you a concise introduction to the topic. This introduction provides the starting point for the exercises; therefore, you should bring your laptop with you including a C++11 or C++14 compiler. 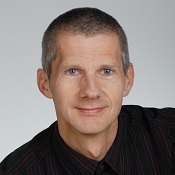 Rainer Grimm has worked as a software architect, team lead and instructor for about 20 years. In his spare time he likes to write articles about C++, Python, and Haskell, but he also likes to speak at conferences. He publishes very often on his blog “Modern C ++“. Now he is a trainer giving seminars on Modern C++ and Python. His books “C ++ 11 für Programmierer”, “C ++”, “C ++ – Standardbiliothek” , “The C++ Standard Library” and “Concurrency with Modern C++” were published by O’Reilly and Leanpub. "Being around lots of folks that share my interests (and understand at a level that is sometimes WAY beyond my own "higher than average" understanding)."